Doel Fin: A Hydrofoil attachment for outboard motors and stern drives. 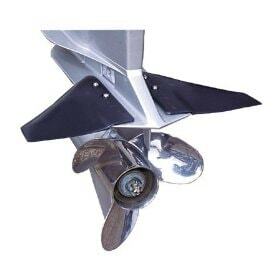 An aeronautical engineer designed Doel-Fin to improve overall performance on boats powered by an outboard motor or a stern drive units. Advertised benefits of this hydrofoil include: Better stability, consistent planing at lower RPM, faster out-of-the hole performance, better gas mileage, steadier turns, higher top-end speeds and lower bow rise at all speeds. So does Doel Fin deliver on its promises? To find out I tested Doel Fin on two different boats. The first one was an Avon 310 RIB rigged with a Mercury 9.9 horsepower, four-stroke outboard motor. The second boat was a 30-foot sailboat rigged with a Mercury Big Foot 9.9 four-stroke outboard motor. Let's begin at the beginning. 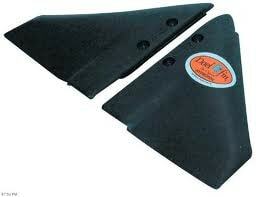 Doel Fin is molded in high-strength plastic. Attachment is as simple as drilling four holes on the outboard motor or stern drive lower unit's anti-ventilation plate. Know that some amateur boaters and professionals alike improperly call it a cavitation plate. It is not. 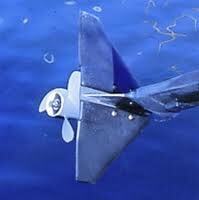 It is called an anti-ventilation plate because it prevents the propeller from sucking air down from the water's surface. With the prop pushing mostly air engine load decreases, rpm race and no thrust is generated. More on that later on in the story when we talk about sail motors (outboard motor auxiliary engines on a sailboat). Meanwhile, back at the the 3/8 inch drill, with all four holes drilled, position the plates and bolt them down tight. Attachment does not violate the factory warranty protection. As for test results, on the Avon 310 RIB I noted a number of immediate improvements. With two people on board it was sluggish to plane and there was an objectionable duration (time) of bow rise. With Doel Fin time-to-plane quickened and bow rise virtually disappeared. The Avon RIB rides on a semi-V hull so control was already good. With a motor that small (9.9 horsepower) it was hard to measure any increase in fuel economy. Though on a larger boat it may improve.